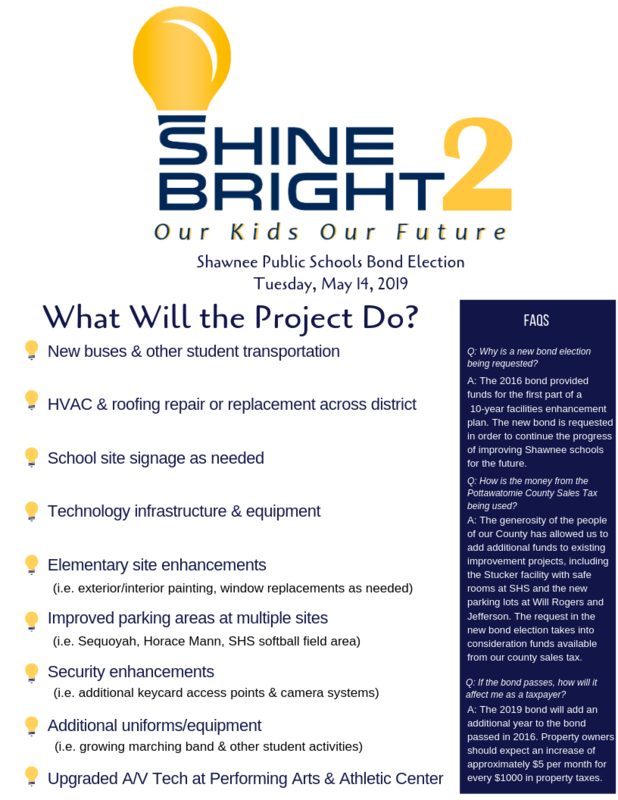 Shawnee Public Schools is dedicated to keeping our community informed about the improvement projects provided by bond elections, sales tax contributions and community support. Please follow this page for up-to-date information on progress we are making. 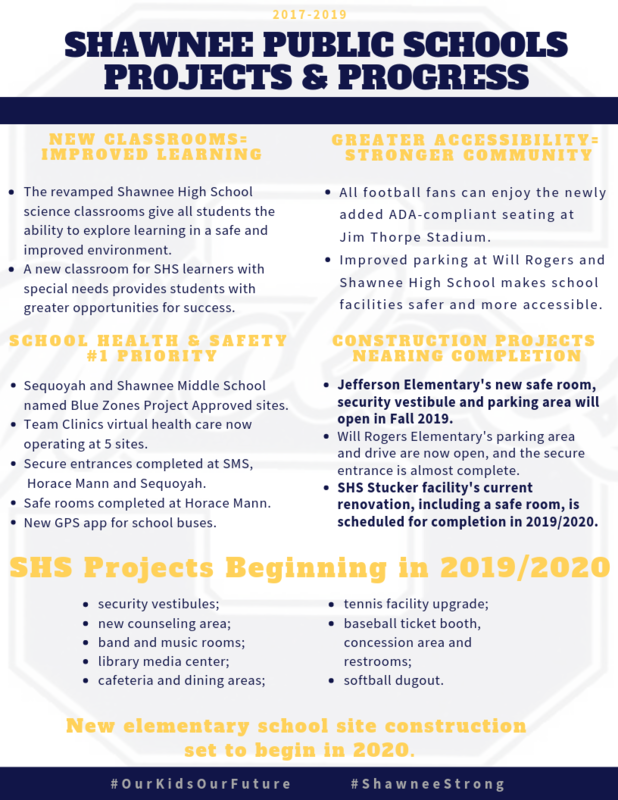 Information on the 2019 bond election scheduled for May 14, 2019, is also available below. Shawnee High School band students have earned impressive ratings at OSSAA state contests this spring. The SHS Wind Ensemble performed at the OSSAA 6A State Contest last week and received superior ratings both on stage and in sight reading. This is the highest honor a group can receive at this contest. The SHS Symphonic Band also performed at the OSSAA 6AE contest last week and received excellent ratings both on stage and in sight reading. Several band students qualified for the OSSAA State Solo and Ensemble contest, earning several superior and excellent ratings. Students earning superior ratings for solos are McKayla Pearce, Caryssa Bui and Mariah Snider. Solos earning excellent ratings came from Bethany Newell and Kamryn Manlapig. Percussion Ensemble I - Bethany Newell, Luke Presley, Levi Wilson, Kamryn Manlapig and Zach Pennington. Trumpet Trio - Mio Dykstra, Paige Iddings and Cynthia Bui. Checking out a library book no longer requires physically going to the library at Shawnee High School. The SHS school library now offers e-books and audiobooks to students and faculty through their app Sora. Sora enables users to download an item from the school's digital collection straight to their mobile device. When the borrowing period ends, the book is automatically returned to the library. Lisa Battige, the school librarian for SHS, said she wanted to add the virtual collection to the library for the convenience of her students. "High school students are so busy," she said. "Between classes, activities, and after-school jobs, it's difficult for students to find time to come to the library. This app is one way I can make sure at least part of our library can be as close to our students as their phones." After downloading the app to their mobile devices, students only have to sign in with their school email address in order to access the 100 digital titles available from SHS. Battige said she plans to add even more titles in the future. "The great thing about this app is that our students aren't limited to what I have for them in our library. 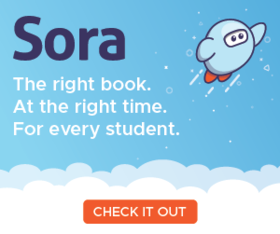 If our students have a Shawnee Public Library card, they can access ebooks and audiobooks from that library through Sora, too." Sora is available on both iOS and Android devices. Anyone needing assistance downloading the app or accessing the SHS library may contact Battige.